In the first of many “he went there” moments from President Donald Trump’s State of the Union Address on Tuesday, the commander-in-chief launched a very thinly veiled swipe at the NFL players who took a knee for the national anthem. The moment came while Trump honored 12-year-old Preston Sharp. The California boy earned a seat next to first lady Melania Trump for a program he started to make sure the graves of U.S. soldiers were marked with American flags. “Preston’s reverence for those who have served our nation reminds us of why we salute our flag, why we put our hands on our hearts for the Pledge of Allegiance, and why we proudly stand for the National Anthem,” said Trump, to wild applause from the Republicans in the Capitol chamber. Reaction to the moment came in fast and frothing. GOP Twitter took note of Democrats’ sullen faces at the invocation of the anthem, while Liberal Twitter said the president invoking the NFL protest undermined any hope of a unifying address. 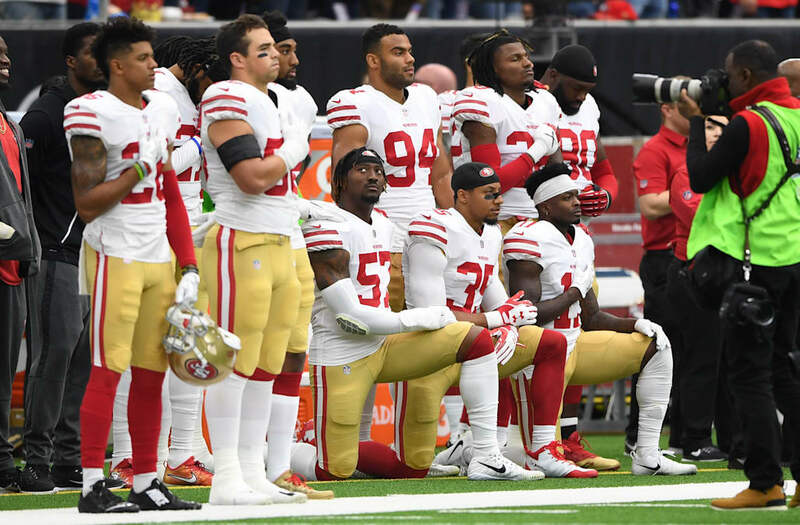 “He shoved sitting for the national anthem right up their asses,” wrote Fox News’ Greg Gutfeld. Trump throwing out culture war red meat to his base, talking about the flag and the national anthem LIKE THEY WERE EVER IN JEOPARDY. Trump emphasizes standing for the National Anthem, Republicans give a rowdy double standing ovation in favor of punishing freedom of speech. Again, the vast majority of the @OfficialCBC did not stand when Pres Trump said "we proudly stand for the national anthem." But hold on while I flick at the culture wars over policing and the national anthem protests.